The National Register of Historic Places and Colorado State Register of Historic Properties are tools that recognize National American Indian Heritage Month and Veterans’ Day, both celebrated in November. Listed in the National Register in 1970, the property encompasses part of pasture land once homesteaded by Chief Ouray and his wife Chipeta beginning in 1875. While at times controversial, Chief Ouray played a significant role in attempts to peacefully navigate the adversity facing the Ute people. The Daughters of the American Revolution first established a memorial at the site in 1924, building a concrete tipi over Chipeta Spring. Chipeta’s body was relocated from Utah to the site in 1925 with a procession reported to have been a mile long. 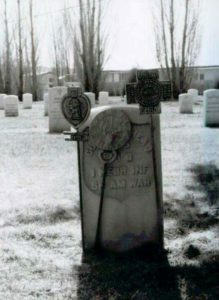 Her brother, Chief John McCook, is buried next to her. In 1947, the Colorado Historical Society (now History Colorado) commissioned landscape architect Saco Rienk DeBoer and Smith and Hegner Architects to design a museum and grounds. The Museum opened to the public in 1956 and is currently being expanded in consultation with all three Ute tribes. For more information, visit: http://www.historycolorado.org/museums/ute-museum-renovation . Listed in the Colorado State Register of Historic Properties in 1995, the State Soldiers’ and Sailors’ Home was founded in 1891 and is the oldest continuously operating veteran’s home in Colorado. The 92-acre complex offered housing, recreational and religious facilities, and medical care, and includes 85 buildings, the cemetery, and lake. The historic district encompasses the 100-year evolution of the facility. 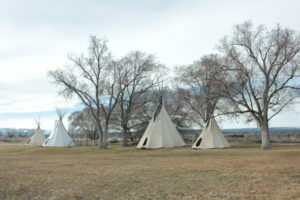 It long provided a home and medical care for Civil War veterans and beyond, but was placed on Colorado’s Most Endangered Places list in 2005. The Homelake Historic Preservation and Restoration Foundation received a Colorado State Historical Fund Grant in 2015 to rehabilitate windows and replace missing hardware at the Administration Building. Working with the San Luis Valley Museum Association and Monte Art Council, the Foundation will create the Homelake Interpretive History and Conference Center. The Office of Archaeology and Historic Preservation’s Heritage Diversity Initiative seeks to celebrate the historic places significant to people of every language, culture, and background that comprise the Colorado story. Check out the growing list of historic places, including those related to the urban American Indian community, at: www.historypin.org/en/person/75043. Submit your own story as well: www.historycolorado.org/oahp/heritage-diversity-initiative.